When we were moving back to the U.S., the thought of not finishing the South African school year seemed like a huge loss. The kids had worked hard all year, were doing extremely well, and (so I hoped) were on track to collect a few prestigious academic awards. You might say that this is the reason you chose the American School (AISJ) over a South African one. And yet. Are South African Schools Behind? 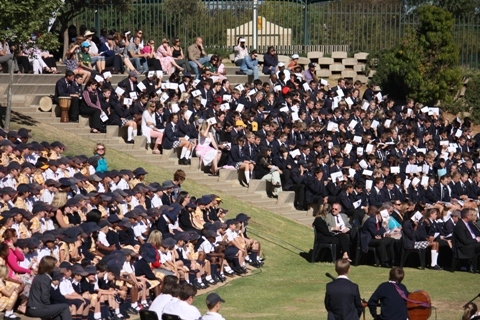 If I ever need reminders that choosing a South African school for our kids was the right thing to do, the recent Founder’s Day ceremony at Dainfern College was the perfect occasion. I've previously spoken about South African Schools in general, and which factors expats should take into consideration when choosing a school for their children. Now it's time to look at specific private schools. Below you will find an alphabetical listing of private schools in Johannesburg, followed by the same list of schools grouped by suburb including a map. If you’re faced with relocating your family to South Africa, your number one concern (after security) will be the quality of your kids’ schooling. Many expats automatically send their children to an international school, just because it makes for an easier transition, and companies typically pay the tuition. But this doesn't mean it's the only or best choice for your child.